The Highlighter is not a sentimental blog. If you have been following it from its start, you’ll notice that it’s changed in the last year. The Highlighter went from a once-every-now-and-then video tutorial to a weekly column covering topical resources available at or through Falvey. It is that time in every graduate assistant’s career, however, when I must graduate and move on, so this Highlighter will be very sentimental. One of my favorite moments at Falvey was getting to Highlight the Diversity and Inclusion Resource Guide, my work on which earned me a Meyer Award, pictured here. In the year that I took over the Highlighter, we’ve covered such topics as Octavius Catto, Advocacy Week, and Lit Fest. Bringing to light the resources we have at Falvey to deepen your experience or understanding of these topics has been a pleasure for me, but I want to mention that assembling these resources is almost never done alone; it requires, as my final highlight, an entire library village. Let me explain the process to you. Our Comm. & Marketing Department Team Leader Joanne Quinn comes to a meeting and tells me the major events on campus or elsewhere that the Highlighter could cover for those looking to deepen their understanding, or, our Library Events and Program Coordinator Regina Duffy reminds me about an event scheduled here at the library that the Highlighter might cover beforehand by directing visitors to helpful resources. Here’s a photo of one half of the Comm. & Marketing Dept. taking in the Idea Accelerator’s “Way too Early For Christmas” Party, also always one of my favorites. With my assignment collected and my information assembled. I set to work bringing the resources to you in an organized fashion, of course bothering PATW author Hunter Houtzer during the composing process. This is how I write a typical Highlighter – but not this week, not on my very last one. This week I just wanted to highlight for you the special love I’ve had in my heart, and will continue to have, for this library village that took me in two years ago. 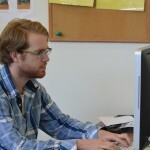 Article by William Repetto, a graduate assistant in the Communication and Marketing Dept. at the Falvey Memorial Library. He has just completed his MA in English at Villanova University. It’s the time of year when my walk to my desk in the library brings me past hordes of engineering and math students huddled around our whiteboards, teams of future nurses cramming in those long lists of anatomical terms, and scores of writers frantically “banging out” those last two, or five, or ten pages before that term paper is due. You might expect this week’s “Highlighter” to cover the journals and databases at your disposal for end of the semester success. You would be sadly mistaken! 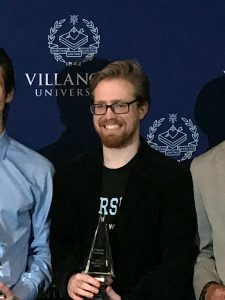 In this week’s column, I’d like to share some of the ways that Falvey has – and will continue to – help relieve students’ end of the semester stress. Two students pose for a photo at our holiday event’s backdrop. Three students pose for a photo at our spud-tacular tater tot bar. 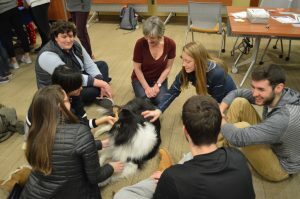 A collie named Cali relaxing with students. 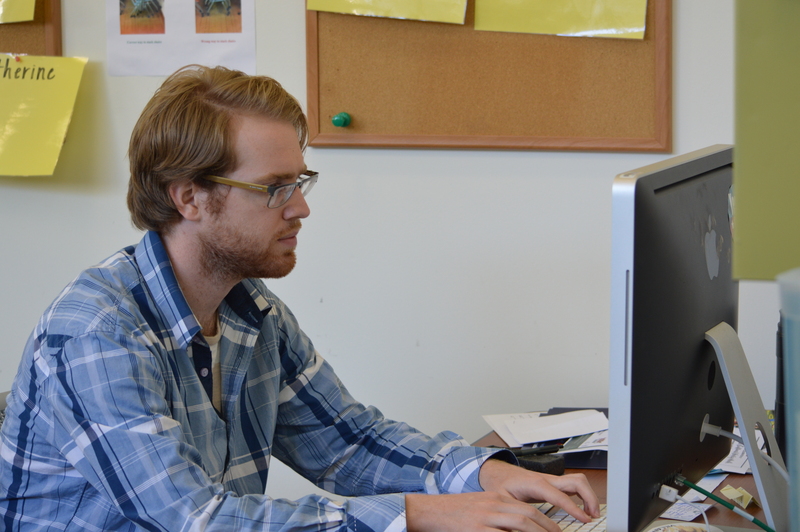 “How in the world, William, is Falvey Memorial Library going to top that?” you might be wondering. Drum roll please! Introducing, or shall we say “reimagining,” Crunchtime! This Thursday, May 3 at noon, Falvey will host a cereal bar – pun intended – in the first floor lounge. Come out and decompress with some of your favorite cereals! Rumor even has it that there will be a new photo backdrop featuring everyone’s favorite cereal – Will D.’s. Ariel Levy will visit Falvey Memorial Library’s Speakers’ Corner as part of the Creative Writing Program’s ongoing Lit Fest today, April 24 at 7:00 p.m. Levy will discuss the publication of her second book, The Rules Do Not Apply, a memoir that recounts Levy’s most personal moments from her memories at Wesleyan University, to her partner’s struggle with alcoholism, to her own miscarriage. This Highlighter brings together some of Levy’s work available to you through Falvey. 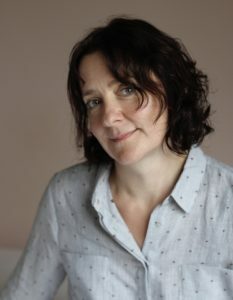 As you will find browsing her already written materials, Levy’s talk promises to unveil how we might channel our own personal difficulties into those things we are most passionate about, for Levy: writing. Ariel Levy poses for a photo. Learn some intensely personal autobiographical information in this essay. 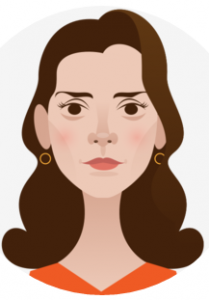 Levy herself claims to have not liked her introverted childhood very much – redeemed by her early decision to become a writer. She contemplates what the future might hold for her own child. Unfortunately, she miscarries in a place far from home – Ulaanbaatar, Mongolia. In this “Best American Magazine Writing, 2014” selection, she recounts the details of that experience. “The New Yorker’s” cartoon depiction of Levy. In this obituary of Edith Windsor, Levy’s latest contribution to “The New Yorker,” Levy gives pedigree information, of course: where Windsor received her degrees and the direction of her career. But Levy stands in awe at the woman who worked to topple the Defense of Marriage Act and who teased her partner, despite their 30 year separation in age, for having too little energy. 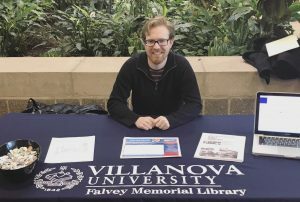 Please join us today, Tuesday, April 17 at 3:00 pm in Falvey’s Speakers’ Corner for a Scholarship@ Villanova talk featuring Ian Clausen, PhD. 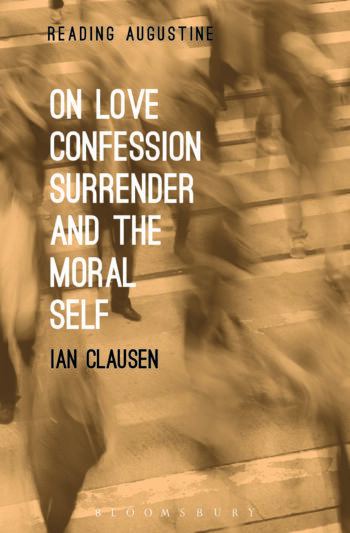 In this book talk, Dr. Clausen will take us through key phases in Augustine’s development as a teacher and philosopher as presented in Reading Augustine: On Love, Confession, Surrender and the Moral Self (Bloomsbury 2017). Describing an intellectual journey that will resonate especially with readers at the beginning of their own journey, Clausen will show that Augustine’s early writing career was an outworking of his own inner turmoil and discovery, and that both were to summit, triumphantly, on his monumental book Confessions. 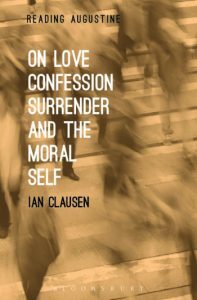 On Love, Confession, Surrender and the Moral Self offers a way of looking at Augustine’s early writing career as an on-going, developing process: a process whose chief result was to shape a conception of the moral self that has lasted and prospered to the present day. As part of our ongoing coverage of the event, we’ve included information on Clausen’s own scholarly works, which are available through Falvey, to bring you a primer on his talk. As a college student at Villanova, you might have pondered about the role of values or ethics in your liberal arts education. I know that I sure have. Clausen has written about this very question in the past in his Seeking the Place of Conscience in Higher Education: An Augustinian View. Centered around the question of how educators can inspire students to encounter their own conscience, this article asks one to think about – among other things – the definition of “conscience,” the third chapter of Genesis, and the role of education more generally. We come to learn that the conscience can, or perhaps ought, to be viewed as a starting place for moral judgment rather than an ending place for negative emotions associated with our actions. We discover that God’s question “where are you?” might have a figurative meaning that drastically alters how we read the fall of man. And lastly, we learn that education might have more to do with bringing us in touch with awareness of truth rather than asking us to transmit the truth. Click the link above to read the article in its entirety; you won’t regret it! 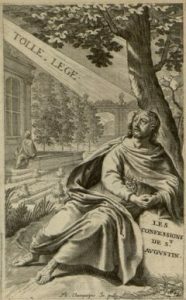 Image of St. Augustine, courtesy of Digital Library. Dr. Ian Clausen is an Arthur J. Ennis Postdoctoral Fellow in the Augustine & Culture Seminar Program at Villanova University. He completed his PhD at the University of Edinburgh, Scotland, where he studied the writings of Augustine under the tutelage of Professor Oliver O’Donovan, and as a recipient of the international British Marshall scholarship. 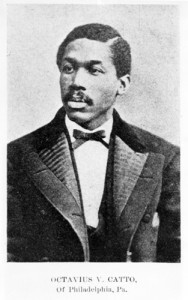 Before that, he received his BA in English and Religious Studies from the University of Illinois. In his research, Dr. Clausen combines a focus on Augustine in his historical time and place, along with an interest in perennial questions around moral agency, formation, and the complexities of human love – all of which he will discuss at the event. The talk, which is free and open to the public, is co-sponsored by Falvey Memorial Library and the Augustine & Culture Seminar Program. Please be sure to join us! 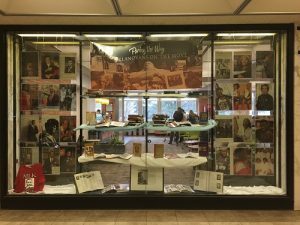 Written by Library Events and Program Coordinator Regina Duffy and Falvey Communication and Marketing Department Graduate Assistant William Repetto. I did not know how curious I could be about the education of a founding father’s daughter until I read this article. You’ll learn about Martha (“Patsy’s”) lavish education at an Enlightenment-inspired girls’ school among a cloister of nuns. Kerrison weaves an approachable style and a truly intriguing topic in this essay to transport you back to immediately pre-Revolutionary France. Roughly a hundred years of US history separates vignettes of oppression and stories of highly educated, independent women in this essay by Kerrison. In fact, fortune often favored northerners at the beginning of this time period as well. Over the course of this essay you’ll discover how Southern women changed this northern, masculine-centric paradigm of learning in early American history. Are you familiar with the story of Sally Hemings and Thomas Jefferson’s intimate relationship? Well, Kerrison retells the tale in a new light. She recounts this history from the point of view of Hemings rather than from the perspective of Jefferson and his reputation. On Wednesday, April 11, “Much Ado About Nothing” opens at the Villanova Theatre. Falvey Memorial Library has a host of resources on Shakespeare, among them Shakespeare in Performance: Prompt Books from the Folger Shakespeare Library. You may use this resource to explore what are called prompt books – it’s right there in the title. “Much Ado About Nothing” Banner, courtesy of VU Theatre. What in the world is a prompt book, you might be wondering? If you are at all like me, and find the development of a play from page to production to be absolute magic, you might find that prompt books reveal the mechanisms of that magic. According to Shakespeare in Performance, a prompt book, “is the production’s bible, containing a wealth of instructions and information alongside the basic text of the play.” In other words, prompt books contain the notes, ideas and thinkings of others who have put on the play before to help the next generation of actors understand and explore the characters, sights and sounds of the play. 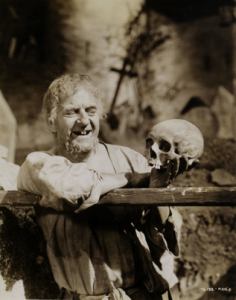 For example, in one book for “Hamlet,” you might find that one actor like to hold the skull aloft during the famous “To Be or Not To Be” speech, where another might like to put it down altogether. In a third book still, you might find notes that indicate an actor likes to hold the skull differently. 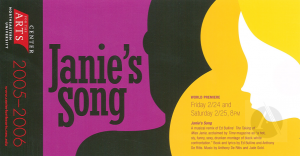 All of these notes help the production staff and performers create a cohesive and purposeful rendition of their show. A photo of that famous speech, courtesy of Shakespeare in Production. All of this is to tell you to search “Much Ado” on the database; you’ll get an insider’s look at how directors choose their staging and how performers decide their diction. Then check out “Much Ado” at VU Theatre on April 11-14 and April 17-21 at 8 p.m. or the matinee showings at 2 p.m. on April 15 and 22. You’ll end up with a ton to talk about! A very special resource lies at the center of this week’s “Highlighter” – the Diversity and Inclusion Resource Guide. As a part of the University’s Center for Peace & Justice Education and Campus Ministry Service Council’s Advocacy Week, Falvey Memorial Library took our newest resource guide’s mission outside the walls of the library. Me! Staffing the Advocacy Week table. You can catch me Tuesday & Wednesday from 11:30 a.m.-1:30 p.m., first floor Connolly. At Advocacy Week, you will find dozens of organizations campaigning for various humanitarian and activist causes. For example, our neighboring table on the first floor of Connolly yesterday were raising awareness about a petition for creating a new safe space on campus. Our work on the Diversity and Inclusion guide is not so much a cause or movement we’re advocating, but we do see our work as similar. The Diversity and Inclusion Resource Guide includes an important activist aspect. On the top left corner of the landing page, you’ll find a resource submission form – our encouragement to you to share any useful library databases you come across in your courses or elsewhere that you think should be part of the page. Secondly, we’re using a hashtag to promote the guide, highlight diversity in the library community and contribute to the page. 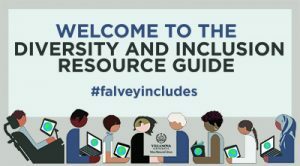 Using #falveyincludes on Twitter, you can add materials to the Diversity and Inclusion Resource Guide that you think are worthy of discussion within the community, e.g. an article, another tweet, or even a photo that calls the library and diversity to mind for you. 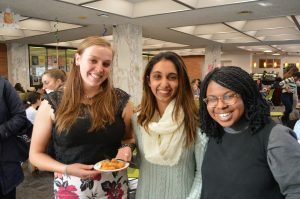 Through Advocacy Week and the Diversity and Inclusion Resource Guide, the Falvey staff hopes to show the profound effects that the library community can have beyond the library building itself. During Advocacy Week, we hope you’ll find out about upcoming events and initiatives here at the library that promote diversity and inclusion, and, with the guide, we hope you’ll explore these very elements of the Falvey community beyond simply this week. 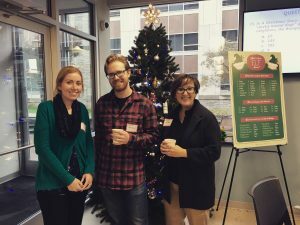 Last week, Falvey Memorial Library launched the Diversity and Inclusion Resource Guide. 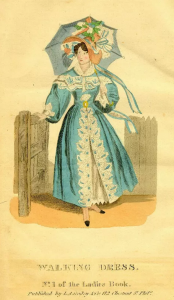 In the spirit of that launch, I would like to highlight a resource this week that shows both an example of an early attempt at diversity and inclusion and also how far we’ve come since those early forays – Godey’s Lady’s Book. Reaching a pre-Civil War circulation of over 150,000, Godey’s Lady’s Book became a locus of American culture by publishing works by such preeminent authors as Harriet Beecher Stowe, Edgar Allen Poe, and Nathaniel Hawthorne. The periodical was published from 1830-1898, and most of its content centered on the empowerment of women. A fashion plate you’ll find on the landing page for this resource. At the moment that these selections seem to promote speaking up and concentrating resources on the education of women, they also confine women to a particular, helpless, and childbearing sphere. This shows a tradition of feminism that goes back almost 200 years in the United States, but it also shows just how far we’ve come – from those perceptions remaining unchallenged to the modern #MeToo Movement and the push for equal pay. 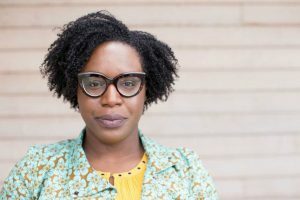 A face of modern feminism, Lesley Nneka Arimah visited Falvey earlier this year. Work for gender equality, more than the continuation of a legacy, remains important in today’s world. Become educated by reading Godey’s Lady’s Book; learn to understand by participating in Women’s History Month, and become an activist by submitting to the Diversity and Inclusion Resource Guide. 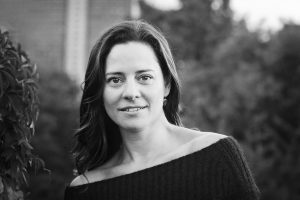 Thursday, March 15 at 7:00 p.m., the President’s Lounge of the Connelly Center will play host to esteemed poet Colette Bryce as a part of the ongoing 2018 Lit Fest. 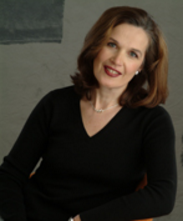 The author of four poetry collections, Bryce has also spent parts of her career as a writing fellow and as an editor. Bryce poses for a photo. See, or shall we say, hear for yourself, with these books by Bryce available at Falvey!